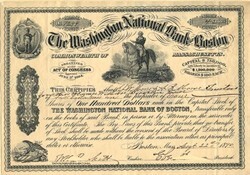 Beautiful certificate from the Washington National Bank of Boston issued in 1890. This historic document was printed by Ward & Cay Stationers and has an ornate border around it with a vignette of George Washington on horseback. This item has the signatures of the Company's President and Cashier and is over 119 years old. Diamond cut through signature for cancellation.